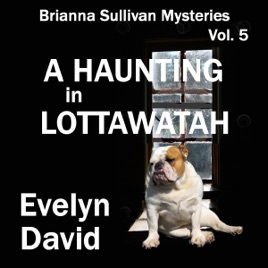 A Haunting in Lottawatah is the fifth book in the Brianna Sullivan Mysteries series. A novella length story, A Haunting in Lottawatah continues the spooky, yet funny saga of psychic Brianna Sullivan who planned to travel the country in her motor home looking for adventure, but unexpectedly ended up in a small town in Oklahoma. In A Haunting in Lottawatah, Brianna is hired to exorcise ghosts from a mansion. But these spirits defy all the rules; a murder confuses the plan; Leon the bulldog continues to run interference as long as he has his beef jerky, and Deputy Cooper Jackson has competition for Brianna's affections. A Haunting in Lottawatah is a "must listen" for mystery lovers and aspiring ghost hunters!